delicious – You're Off the List! 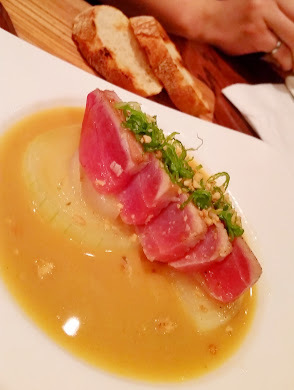 For my birthday this year, my hubby took me out to Fin Izakaya. We have been here a few times for other celebrations but it has been a while since we’ve been back. I usually enjoy the food as I do love Japanese cuisine. 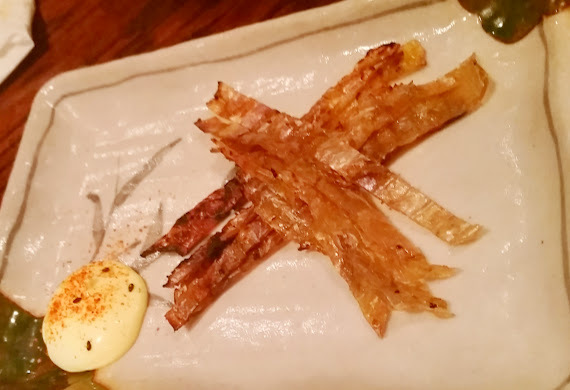 It’s quite refreshing to visit an izakaya rather than the usual sushi bars or AYCEs. The Izakaya phase does seem to have died down, but there weren’t that many that has spurred during the popularity of this style of Japanese cooking. I wonder if it has to do the pricing? On this visit, Fin was hosting one of their fish auctions, but unfortunately by the time we finished dinner, it hadn’t started yet. I really would like to go through one of these auctions and see what it’s like. I’m not aware of any other restaurants that hosts these. We had made our reservations on Open Table (www.opentable.com/), but there was no one waiting at all. Every time we visit, we’ve never had to wait more than 5 minutes and we’ve always had reservations. They are very consistent at ensuring their patrons are seated and those with reservations do not have to wait. I greatly appreciate that. Some places we’ve been to, even if you have a reservations, you’re just lining up when you get there. Let’s start with their parking. I find it great that they provide parking space for dinner customers since it’s quite hard to find parking on that part of Eglinton. The only thing that’s inconvenient was getting into the lot. I called to advise we were approaching the entrance. The person on the phone asked if we were right at the gate. I advised him that we were just about to swing around to turn in as the construction was blocking the entrance from the westbound lanes. He advised me to call back when we’re right at the gate or just come inside. It was literally 30 seconds later when we found ourselves in front of the parking gate, but no one picked up the phone. My hubby stayed in the car as I ran into the restaurant. When I entered the restaurant, I advised the hostess my hubby was at the parking lot and she sent someone out to let him into the lot. She noted my reservation and proceed to seat me. Upon coming in, my hubby advised that after the attendant let him into the lot and told him where to park, he disappeared through a staff entrance and didn’t tell my hubby if the front entrance was the only way back. We had a server come to us within a few minutes to ask what we would like to drink. Throughout the rest of the evening, our food was always presented to us, they came to check on us throughout the evening, and the bill was prompt. The only other item for service to note was when we asked for the rice for out hot pot. We couldn’t find our server, so another server came to our table and when we told her we would like to add the rice to the hot pot, she said we when we finished the items in the pot, then let her know and she’ll take it to make the rice. Moments later, our server came and asked if we wanted to make Okayu/Zosui (can’t remember which term he used). We said “sure”, and he took the pot away. We still had the crab claw and a few clams in there, but he got the chefs to make the porridge anyways. Almost everything was excellent. 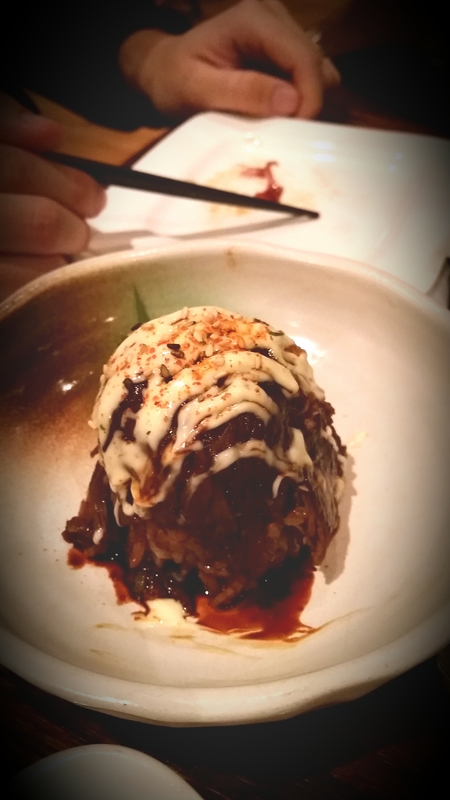 Loved the Beef Rice Bomb with the sweet/salty teriyaki like sauce. The mayo adds a creamy texture to coat the beef and rice. I always like the Dried Fish Kawahagi. It’s basically fish jerky. It has a nice subtle hint of sweetness, charcoal fragrant from the grill, and is chewy like jerk. Great appetizer to go with a drink. 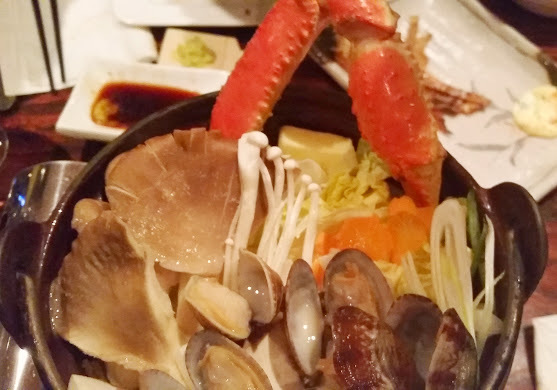 The Hot Pot Crab and Asari Clam was our favourite of the night. The broth was a delicious concoction of seafood goodness. It had clams, shitaki mushrooms, cabbage, a crab leg, enoki mushrooms. 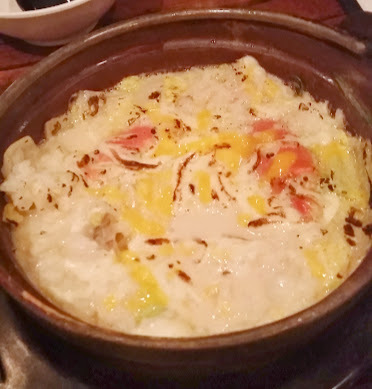 What made it even better was the essence of the soup was used to make an Okayu (rice porridge). I’d have to say, that was the best Okayu I’ve ever had. Milky, creamy, cheesey seafood flavoured okayu. I don’t know how they got so much flavour out of the broth, because there wasn’t that much seafood in the pot. The Sea Bream Sashimi was very fresh. No metal like taste or fishiness at all. It had a firm, crunch texture. Beautiful red, pink, white colour. After we ate the meat, we had the carcass grilled with salt. It was nice and light. Went well with our okayu. The Tuna and Garlic rare steak had a great soft yet slightly firm texture. It was served atop of onions. Although it was cooked tataki style, it didn’t carry much cooked flavours. It wasn’t as garlicy as we would’ve liked. Actually I tasted more sweet onion flavour than garlic. Duck Shichimi Yaki. 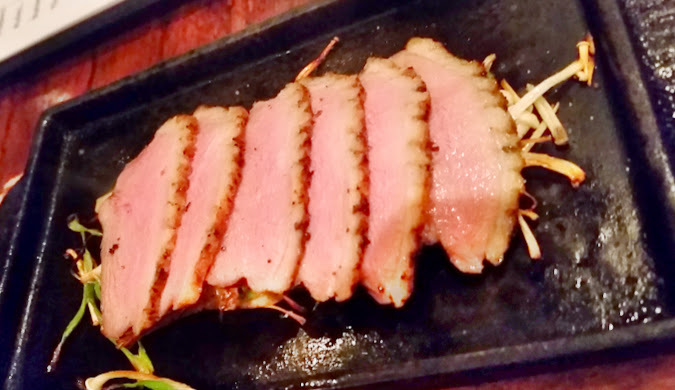 It’s basically grilled slices of duck. I’m pretty sure it was duck breast that was served on a bed of enoki mushrooms. It was nice pieces of duck. I didn’t find it extraordinary or anything that stood out, but it’s carried a subtle heartiness. The Chicken Winglettes unfortunately was a little under whelming. Yes it had a great crunchy without the oil and batter, but overall it just didn’t stand out in anyway. Each of them only had 1 bone, so it was nice to not have to chewy out 2. There wasn’t much fat content like your usual wings. The red salt did have a hint of sweetness to it, but it was just lightly sprinkled on, so it was very hard to taste it. I didn’t try my hubby’s Asahi, but he had no complaints and ordered a second too. 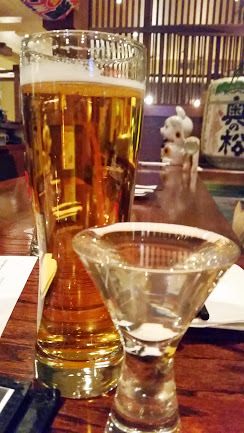 The pear Sake was very refreshing. Sake is a strong alcohol and I know not everyone likes it. With the subtle hints of pear, it adds a fresh lightness to the drink. Don’t be fooled though, it’s still 15%-20% of alcohol. We’ve never had issues with cleanliness at Fin. Tables are always clean when we are seated. We’ve never had to change cutlery. If food is dropped on the floor, it is cleaned up immediately. We don’t have any complaints. 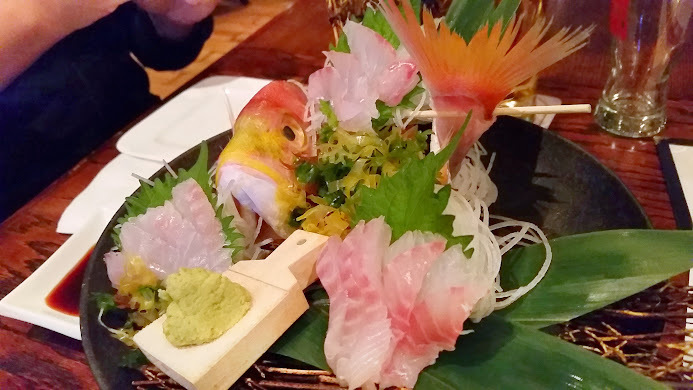 Food flavours overall were well developed, sashimi is fresh, drinks are good, general service is good. There really isn’t much else I would say about Fin. 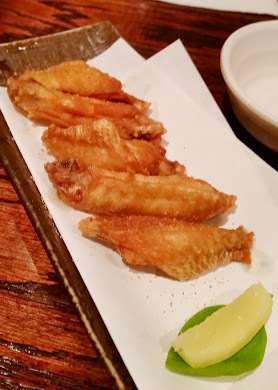 It’s one of our usual spots when we feel like izakaya. The overall experience of this visit was great. 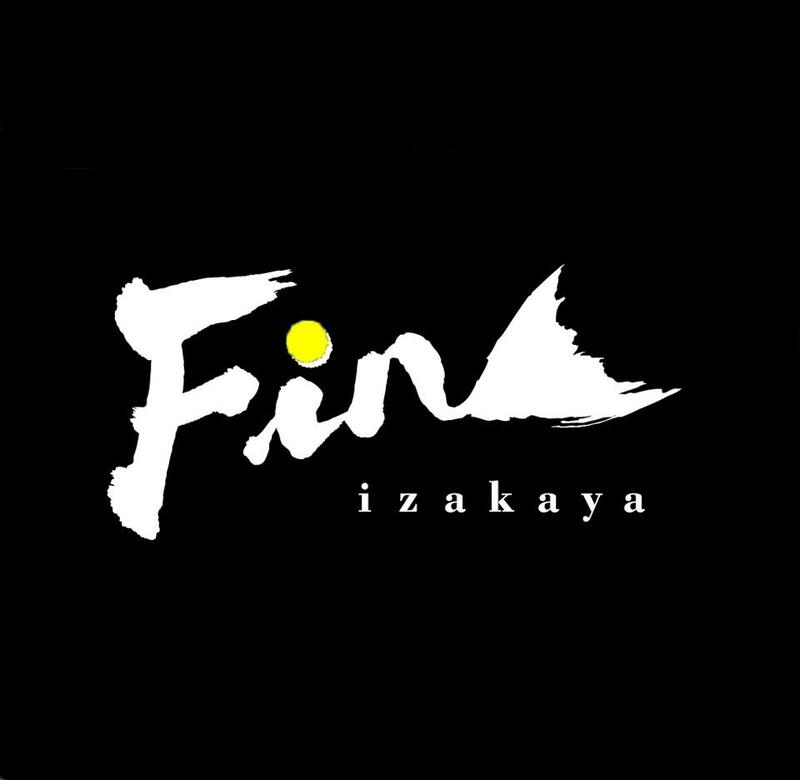 Fin Izakaya, you’re YOL Approved!